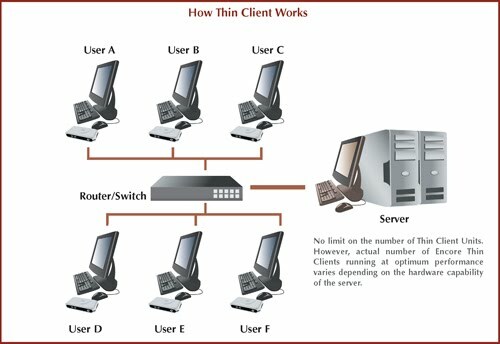 Thin Client is a low cost - centrally managed computer. It generally does not have any type of Disks, CDROM etc. Uses computing resources of server and not client. As a result the performance of client machine is not dependent on the client hardware; rather it is depended on the server hardware. Thin Client computing is not just sharing of Desktop - it is very advanced solution, where you have Complete security and privacy of data. IN FACT IT IS MORE SECURED THAN FAT CLIENT ENVIRONMENT. Animation - 2D or 3D. All types of ERP - even SAP can be run on Thin Clients. Lower IT administration costs. 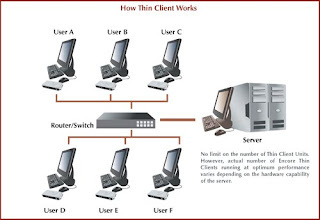 Thin clients are managed almost entirely at the server. The hardware has fewer points of failure. Easier to secure. Thin clients can be designed in such a way that no application data ever resides on the client, centralizing malware protection and reducing the risks of physical data theft. Lower hardware costs. Thin client hardware is generally cheaper because it does not contain a disk, application memory, or a powerful processor. 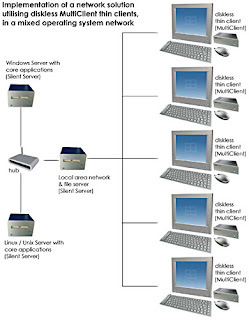 Since terminal servers typically reside on the same high-speed network backbone as file servers, most network traffic is confined to the Server. In a fat client environment if you open a 10MB document that's 10MB transferred from the file server to your PC. When you save it that's another 10MB from your PC to the server. When you print it the same happens again – another 10MB over the network to your print server and then 10MB onward to the printer. This is highly inefficient. In a thin client environment only mouse movements, keystrokes and screen updates are transmitted from/to the end user. This can consume as little as 10-15 Kbit/s bandwidths. If the peak resource usage is above a pre-defined limit, it is a relatively simple process to add more resources to server (be it power, processing, storage), boosting resources to exactly the amount required. The existing units can continue to serve alongside the new. Whereas a thick client model requires an entire desktop unit be replaced, resulting in down-time for the user, and the problem of disposing of the old unit. Less Wasted Hardware. Computer hardware is very environmentally damaging. 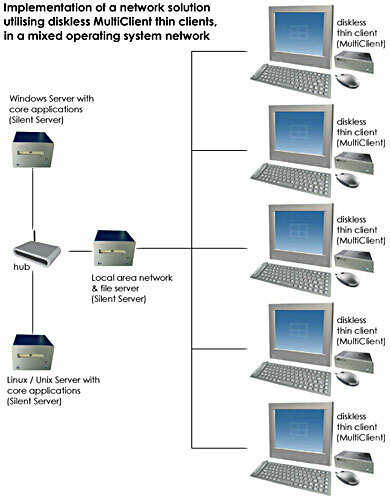 Thin clients can remain in service longer and ultimately produce less surplus computer hardware than an equivalent thick client installation.